Be your own professional baby photographer with this clever Surfer Scene backdrop, which also comes with an attractive set of monthly milestone stickers that allow you to mark and remember each stage of their development. This kit is the brainchild of Australian-owned company, Baby Made who specialise in novel ways for you to enjoy those precious first years of your child's development. Best of all the backdrop is durable and may be wiped clean. You can also make it unique by colouring it in with crayons or markers - even scattering it with glitter. Your friends and family will probably think you had a professional photo session, until you let them into your secret. Style your baby against the backdrop and add your monthly sticker. Keep track of how your baby is growing month-to-month. Surfer Scene backdrop can be wiped clean. Send professional looking baby portraits to family and friends. Makes a fun gift for a new arrival. 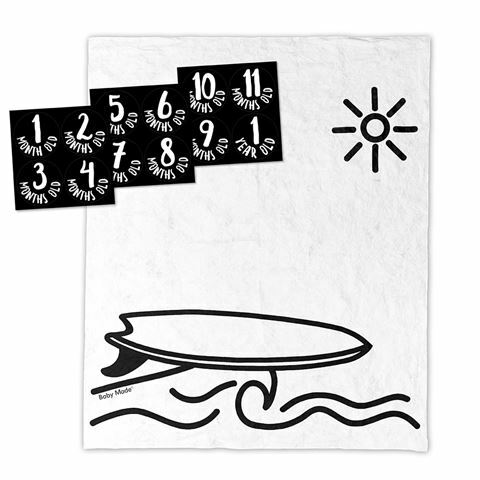 Surfer Scene backdrop 100cm (l) x 100cm (h). 12 milestone stickers from one month to one year. Zippered pouch to keep it in.